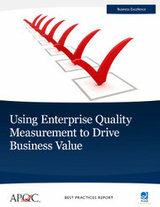 Organizations have long recognized the need to assess the quality of products and services, but only in the past few years have a substantial number of organizations pursued the measurement of enterprise-wide quality. Business success depends on quality processes and outcomes at every level. This report investigates the foundational practices every organization needs to successfully evaluate quality as well as the emerging practices a few leading organizations are employing to stay on top of their quality efforts. Along with comprehensive analysis of the study findings, the report includes case studies of Altera Corporation and Chemonics International. Click here to read an overview of this report.